Honoring one of the world's most revered artists, The Music Center celebrated Joni Mitchell on November 6 and 7, 2018, with two all-star concerts - JONI 75: A Birthday Celebration Live at the Dorothy Chandler Pavilion - and an exclusive gala, co-hosted with Vanity Fair and its editor Radhika Jones, which feted her 75th birthday and raised funds for The Music Center's artistic programming, specifically free and low cost programming for underserved communities. The concerts featured performances by Brandi Carlile; Glen Hansard; Emmylou Harris; Norah Jones; Chaka Khan; Diana Krall; Kris Kristofferson; Los Lobos with La Marisoul, Cesar Castro & Xochi Flores; Graham Nash; Seal; James Taylor; and Rufus Wainwright. The artists lit up the Dorothy Chandler Pavilion stage performing Mitchell's songs, which spanned all stages of her career. Co-musical directors Brain Blade and Jon Cowherd provided the evenings' musical arrangements. Over the two nights, more than 6,000 concert-goers enjoyed more than 20 of Mitchell's songs from the entire oeuvre of her 20 studio albums. Chaka Khan whipped up the audience with "Help Me" with backup vocals by both Rufus Wainwright and Seal, while Seal brought the house down with his heartfelt rendition of "Both Sides Now." Graham Nash, the only artist to sing a song outside of Mitchell's songbook, surprised the audience with "Our House," the song he wrote about what he referred to as an "ordinary moment" in his "far from ordinary" life together with Mitchell; Nash created a singular moment as the entire audience joined him in the chorus. Kris Kristofferson, who received a standing ovation, offered a touching, delicate version of "A Case of You," in a tender exchange with Brandi Carlile, while Rufus Wainwright delivered a deeply haunting and personal rendition of Mitchell's classic "Blue." Emmylou Harris gave a deeply moving and intimate performance of "The Magdalene Laundries." Los Lobos with La Marisoul, Cesar Castro & Xochi Flores turned both "Dreamland," and "Nothing Can Be Done" into Latin dance numbers, with Chaka Khan singing backup on "Dreamland," reminiscent of her recording of the song with Mitchell. Diana Krall and Norah Jones added new depth and expansive shades with their velvety tones to Mitchell's music and lyrics with "Amelia" and "For the Roses," as well as "Borderline" and the show opener, "Court and Spark," respectively. Glen Hansard's rendition of "Coyote" and "The Boho Dance" were raw and existentialist musings on the human condition, while Brandi Carlile lifted the audience with her transformative version of "Down To You." James Taylor provided the penultimate number, closing the evening with a personal and moving version of "Woodstock" with backup vocals provided by Seal. Los Lobos with La Marisoul, Cesar Castro & Xochi Flores; the band; and all the other artists played a Latin-infused version of "Big Yellow Taxi," with the singers trading verses and choruses and the audience joining in. Mitchell, for whom the start of the November 7 concert was held as she made her way to the theatre in traffic, joined the audience to a standing ovation before the performance began. At the conclusion of that concert, Mitchell made a surprise appearance on stage, taking a bow to solo applause from the rapturous audience and then joined with the other artists to sing a reprisal of "Big Yellow Taxi. A cake was brought onto the stage with the band playing "Happy Birthday" as Mitchell blew out the candles. Throughout the concert, audiences saw both images of Mitchell's paintings and many never-before-seen images of Mitchell taken by rock photographer Norman Seeff, as well as images by Seeff's contemporaries Henry Diltz and Nurit Wilde; Seeff created the visual sequencing to match the songs. Mitchell was also lauded with special video birthday messages from both Elton John and Peter Gabriel. The band included Brian Blade/drums, Jon Cowherd/piano, Christopher Thomas/bass, Greg Leisz/guitar & pedal steel, Marvin J. Sewell/guitar, Jeff Haynes/percussion, Ambrose Akinmusire/trumpet, Bob Sheppard/woodwinds, along with guest artist Scarlet Rivera/violin. The Music Center's Artistic Advisor Jorn Weisbrodt is the creator of the two evenings including both the concerts and the design concept for the gala. Danny Kapilian is the music producer. The concerts, produced by The Music Center's Senior Producer Nick Schwartz-Hall, were filmed and recorded for broadcast, limited theatrical release and an album release with details to be announced at a later date. 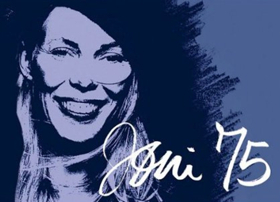 "We set out to truly celebrate Joni and make her the happiest on her 75th birthday. We achieved that and so much more," Weisbrodt said. "Everyone who helped with these shows, as well as the audiences all felt this was something bigger and deeper than all of us. Joni takes us onto the rivers, clouds and, sadly, the 'paved paradise' of our shared human existence. She knows the mystery of joy is giving it." Immediately following the November 7, 2018, concert, The Music Center honored Mitchell with a star-studded celebration - The Music Center's Soirée: JONI 75 - in the Eva and Marc Stern Grand Hall of The Music Center's Dorothy Chandler Pavilion (Stern Grand Hall). During the highly festive event, The Music Center recognized Mitchell with The Music Center's Excellence in the Performing Arts Award, acknowledging her pioneering spirit and timeless art and music. Mitchell's long-time friend, legendary writer, author and director Cameron Crowe presented her with the award. The Music Center first bestowed this award, which salutes individuals who are innovators in the creative and performing arts, upon another great artist - actress, dancer and singer Rita Moreno - in 2016. According to Rachel Moore, president & CEO of The Music Center, Mitchell continues to be an inspiration to the artists of today and tomorrow. "Joni Mitchell's many talents and artistic contributions epitomize The Music Center's belief in the power of the arts to deepen the cultural lives of all. Indeed, Joni reminds us in 'Woodstock' that 'life is for learning.' We have all learned so much from her and continue to be inspired by her remarkable strength, courage and passion," Moore said. In presenting the award to Mitchell, Crowe offered, "She remains our best field reporter in matters of the heart, or in the world...or if you're just looking for an excuse to kick up your heels and feel more alive. She is heavenly inspiration at a time when heaven is in short supply." The Music Center reported that its Soirée brought in nearly $1.1 million, exceeding its goal for the event. Proceeds from the event will help the organization advance its efforts to deepen the cultural life of every resident of Los Angeles County through dance, arts education, special events and community engagement. "We are grateful to our many donors and humbled by their contributions and the impact they make in our community, and are equally humbled that they have placed their trust in us to help realize our vision," Moore said. Numerous celebrities, VIPs and many Music Center supporters attended the gala, including The Music Center Soirée: JONI 75 Co-chairs Kiki and David Gindler; Barbara and Jay Rasulo; Catharine and Jeffrey Soros; Eva and Marc Stern; Phil Swan; and Music Center Board Chair Lisa Specht. Celebrity guests included Rosanna Arquette, Angela Bassett, LeVar Burton, Cameron Crowe, David Geffen, Jake Gyllenhaal, Jon Hamm, Darryl Hannah, Tom Hanks, Anjelica Huston, Eric Idle, Mandy Moore, Katie McGrath, George Takei, Lily Tomlin, St. Vincent, Jane Wagner, Rufus Wainwright and Rita Wilson. Along with support from the co-chairs, The Music Center's Soirée: JONI 75 received key contributions from Gerry Ibanez, The Field Family Foundation, Terri and Jerry Kohl, Porsche Cars North America and the Consulate General of Canada in Los Angeles. More than 450 guests enjoyed both the concert and the dinner in Stern Grand Hall, which was transformed into the rugged coastal outdoors of the Southern British Columbia Sunshine Coast where Mitchell has had a home for years, and where many of the songs performed in the concerts were written. The setting for the event featured a beautiful late summer outdoor party with a 100' x 16' projection screen that showcased stunning panoramic ocean views of the Sunshine Coast. Guests walked on freshly harvested sod, laid throughout the entire hall, giving the event a natural, soft aesthetic, with the smell of fresh cut grass lingering in the air. The seemingly mismatched tables and chairs were juxtaposed with the traditional mid-century modern style of The Music Center's Dorothy Chandler Pavilion, offering a rugged and elegant look. Tables were lit with lanterns, giving the room a warm, welcoming glow, and guests were welcomed with the sounds of nature as a choir of crickets greeted them as they entered the event space. Patina Chef Omar Bernal honored Mitchell with a menu inspired by some of her favorite dishes and flavors from the Pacific Northwest, including a family-style salad duo including Scarborough Farms Greens and North American Lobster, followed by a delicious Cape Grim Filet of Beef or a vegan Butternut Squash Steak. Guests were treated to a special vanilla birthday cake along with S'mores and Jim Beam Bon Bons, also served family-style. In a special surprise for Mitchell, her childhood friend, Sharolyn Dickson, fulfilled the final step in Mitchell's accepting the honor of her First Nations name, "Sparkling White Bear Woman," from the First Nations of her hometown in Saskatoon, Saskatchewan, Canada. This is a Saulteaux name given in a sweat ceremony on Yellow Quill First Nation, Treaty 4 in Saskatchewan. Mitchell has always been inspired by First Nations, making countless references in her songs and attending sacred ceremonies. In recognition of this honor, The Music Center chose a basket by the Northern California Pomo Nation (circa 1900) to serve as The Music Center's Excellence in the Performing Arts Award. Honoring Mitchell's First Nations name, the evening's entertainment was provided by Neqotuku First Nation operatic tenor and composer Jeremy Dutcher from Eastern Canada, winner of Canada's highly prestigious 2018 Polaris Music Prize, as well as by Mitchell's long-time friend Rick Whitfield and his band. In addition, artist and Music Center Board Member Glenn Kaino honored Mitchell with a piece that is sculptural yet completely ephemeral at the same time. Kaino's music box sculpture plays Mitchell's "A Case of You," activating the musical keys with Mitchell's own paint brushes, fusing her art of painting and songwriting. Mitchell was joined at her table by David Geffen, Cameron Crowe, Graham Nash, James Taylor and Elliot Roberts, among others. She was also surrounded by a close group of friends, including her earliest childhood friends from her hometown, along with her daughter Kilauren Gibb and grandchildren Marlin & Daisy. As they left the Soirée, guests received a special gift from Mitchell, which she personally designed. This article has been viewed 663 times since being added on November 9, 2018.